Prague Castle (in Czech: Pražský hrad) is the largest ancient castle in the world. It is perhaps the most important landmark in the magnificent city of Prague and it absolutely dominates the city’s skyline. 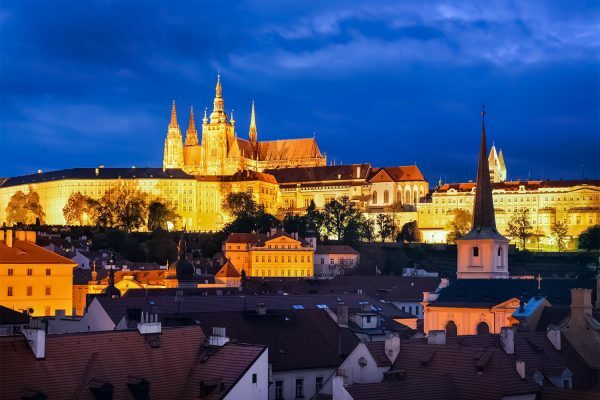 More than 1.8 million tourists visit Prague Castle every year, and indeed, it is hard to miss it. You will see it from many places along the Vltava and from numerous observation points in the Czech capital. Finding Prague Castle is very easy and there are multiple ways to get there. The most popular and convenient option is tram line no. 22 and the stop Pražský hrad. The Malostranská metro station on line A is also nearby. However, going to the castle from there requires an uphill walk. If you don’t feel like it, you may choose the metro when exiting the castle and it will be a pleasant downhill stroll. Opening times are different for various parts of the castle and they vary by season. It’s recommended to check them on the official website. 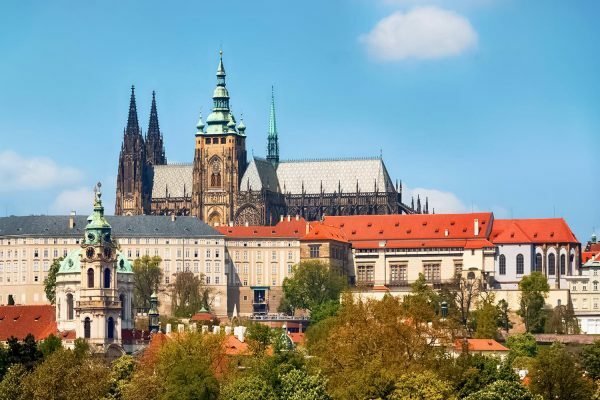 The history of Prague Castle dates back to the 9th century, when Duke Bořivoj I built the Church of the Virgin Mary there. This church was destroyed in the 13th century. In the 10th century, Duke Vratislaus I (Vratislav I) with his son Wenceslaus I (Václav I), a.k.a. St. Wenceslaus, founded the Basilica of Saint George nearby. In the 12th century, the settlement was re-built into a medieval stronghold. In the 14th century, during the reign of King Charles IV, the foundations of St. Vitus Cathedral were laid. Charles IV also strengthened the fortifications of the castle and the royal palace was re-built in the Gothic style. 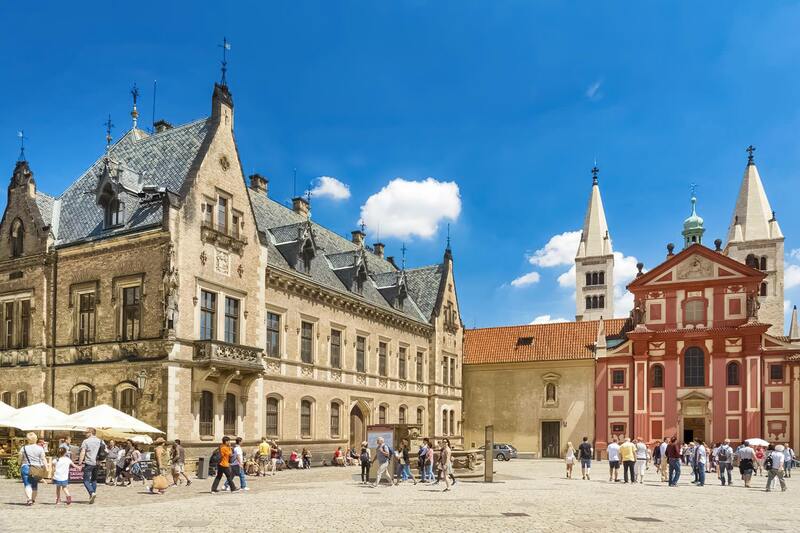 In 1382, Bohemian kings moved out of Prague Castle and lived in the Royal Court for more than a century. The Royal Court (Králův dvůr) was located in the Old Town. The building of the Royal Court was abandoned for a long time and dilapidated in the 19th century. It was demolished in 1903. On its site, the beautiful Municipal House (Obecní dům) was built. In 1483, Bohemian rulers returned to the castle, when the dynasty of Jagellons decided to use it as their seat. Subsequent centuries witnessed further development of Prague Castle. Vladislav II commissioned the magnificent Vladislav Hall and it was completed in 1502. The hall is still used by the modern Czech state for representative and ceremonial purposes. The next dynasty, the Habsburgs, remodelled sections of the castle in the Renaissance style. They also added new buildings and the Royal Gardens (Královská zahrada). During the reign of Rudolf II, Prague Castle became the residence of Holy Roman Emperors and the whole city of Prague gained on importance. Prague became the center of the Holy Roman Empire. In 1618, the second Prague Defenestration took place at the castle. Defenestration is a rather violent incident in which multiple people get thrown out a window. The word “defenestration” is derived from the Latin word for window: fenestra. In 1618, two Catholic counts and their scribe were defenestrated by Protestants from the third floor of Ludwig Wing in the Old Royal Palace. All of them survived the incident, but the event triggered a long period of religious conflicts, known as the Thirty Years’ War. It was a very bad period for Prague Castle, it was damaged and robbed. In the second half of the 18th century, Empress Maria Theresa ordered major rebuilding and renovation of Prague Castle. The Holy Roman Empire was dissolved in 1806 when the last Holy Roman Emperor, Francis II, abdicated. From 1804, he reigned as Emperor Francis I of Austria. The imperial seat of the Austrian Empire was not Prague, but Vienna. The importance of Prague Castle and the whole city diminished significantly. In 1848, Emperor Ferdinand V abdicated and chose Prague Castle as his residence. In 1918, the first Czechoslovak Republic was proclaimed. Prague was the capital of the new state and Prague Castle became the seat of the Czechoslovak president Tomáš Masaryk. Nowadays, it is also the residence of the head of state: the president of the Czech Republic. But Prague Castle is much more than that. Many sections of the castle are open to the public and millions of tourist gladly visit it. The castle is the place where Czech crown jewels are kept. Countless historical and artistic treasures are displayed or stored there. It is a symbol of Czech statehood and the history of Czechia throughout the centuries. Golden Lane (Zlatá ulička) is a beautiful small street with colourful houses. Franz Kafka lived there for some time. St. Vitus Cathedral (Katedrála svatého Víta) is a Roman Catholic cathedral and the seat of the Archbishop of Prague. In its current form, it was built in the 14th century, but the first church at that site was built in 930 and it was also dedicated to St. Vitus. As a matter of fact, the cathedral was officially was re-dedicated to St. Vitus, St. Wenceslaus and St. Adalbert in 1997. Nevertheless, it is still commonly known as St. Vitus Cathedral. St. George’s Basilica (Bazilika Sv. Jiří) is the oldest surviving church building in the castle complex, founded in 920 and expanded in 973. The Baroque facade is from the 17th century. Old Royal Palace (Starý královský palác) is located in the southern wing of Prague Castle. This part of the castle served as residence for Bohemian kings from the 10th to the 16th century. The main sights in the Old Royal Palace are All Saints Church (Kostel Všech svatých) and Vladislav Hall (Vladislavský sál). New Royal Palace (Nový královský palác) is a complex of buildings in the western part of Prague Castle. This section has served the rulers as residential and representative space since the 16th century. 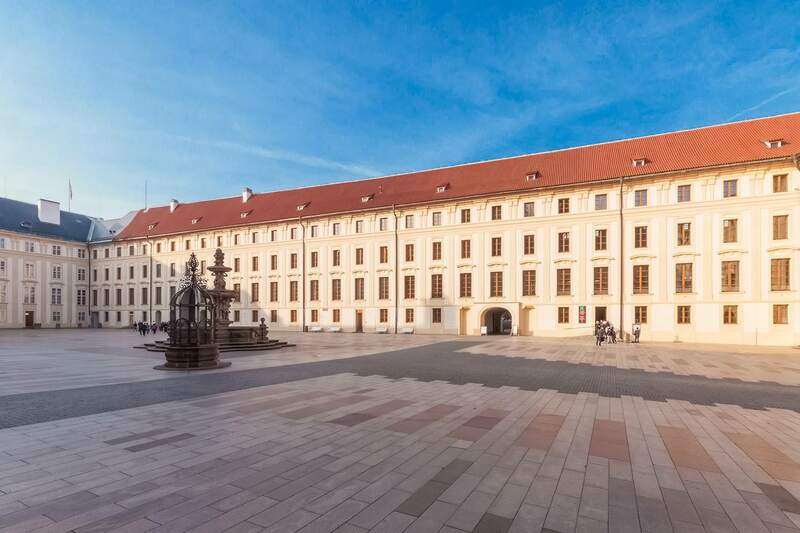 During the reign of Maria Theresa from the Habsburg dynasty (1740-1780), the facades of the New Royal Palace complex received a consistent look. Nowadays, the President of the Czech Republic receives his visitors there and some halls and rooms are not open to the general public. The famous Spanish Hall (Španělský sál) is in the New Royal Palace. The Royal Garden (Královská zahrada) is a Renaissance garden created during the reign of Ferdinand I (Holy Roman Emperor) in 1540. It is located north of St. George’s Basilica. Are you coming to Prague? 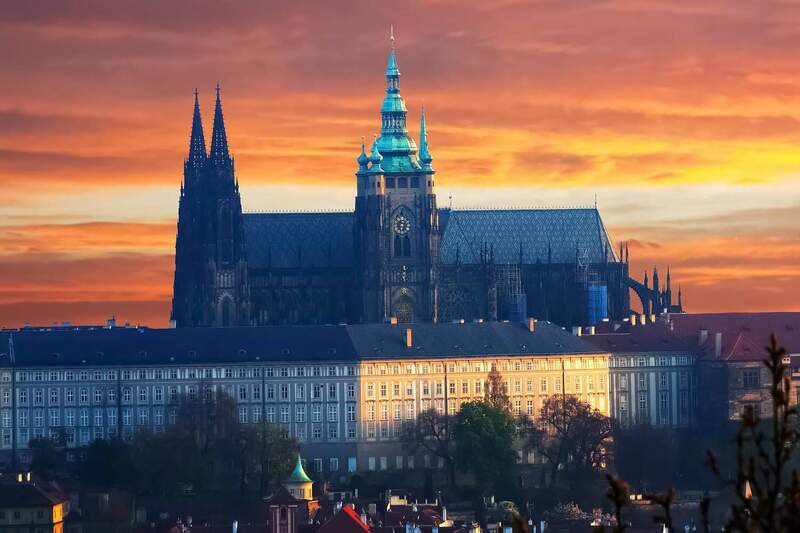 How about staying near Prague Castle? The Charles is a fantastic 4-star hotel located in the very center of Malá Strana. The price level is very attractive for a hotel of its class and in such a convenient location, so booking in advance is recommended. Prague Castle and Charles Bridge are within walking distance. Check the rates and book your room. Hotel Waldstein is an amazing hotel near Prague Castle. It is a 4-star, boutique-style hotel, but you might be surprised how attractive the rates can be, considering the hotel's class and location. The hotel is in a beautiful medieval house from the 14th century and the rooms have vintage furniture, so staying there will be an interesting experience. Tram lines and metro are nearby. Check the rates and book your room. Hotel U 3 Pstrosu is an attractively-priced 4-star hotel between Charles Bridge and Prague Castle. An amazing location, fantastic value for money and great reviews from guests. To get to the Old Town, you just need to cross Charles Bridge. A room in a great 4-star hotel in Prague will generally cost you much less than in most other popular European destinations. Check the rates and book your room.